You know what’s better than freshly baked banana bread? Freshly baked banana bread cookies. These delectable treats are crispy on the outside, tender on the inside, with a nice crunch from the walnuts. 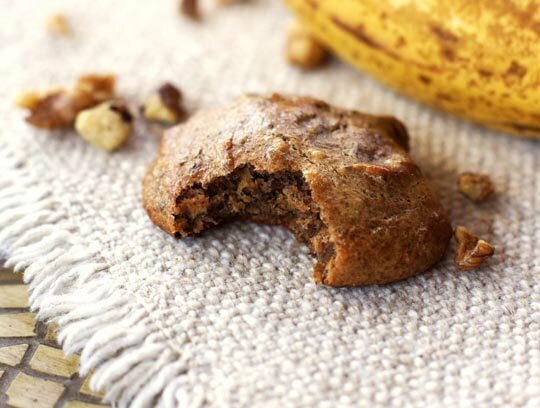 They pack a huge banana flavor, without being overly sweet–> in fact, there is no additional sugar to worry about, making these a perfect “snack” cookie. At least, that’s what I keep telling myself as I go back for another helping. Preheat your oven to 350F. In a medium bowl, mix together all the ingredients until well combined. Allow the mixture to sit for about 10 minutes– letting the flax “gel” into the batter. 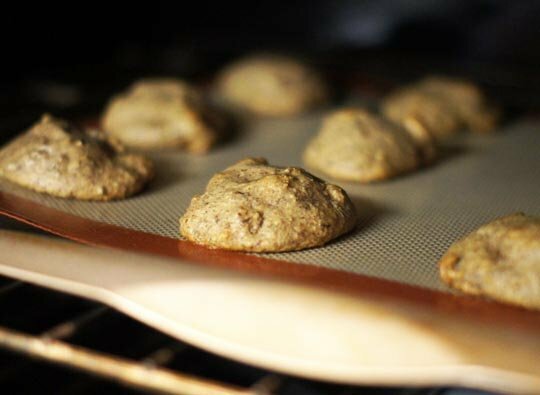 Using a tablespoon, or cookie scoop, drop the cookie dough onto a baking sheet lined with a Silpat, or parchment paper. Bake for 10 minutes at 350F, turning the pan halfway through the baking time for even browning. Let the cookies to cool on the pan for 10 minutes, then transfer to a wire rack to cool completely. These cookies didn’t last long in my house, so I recommend making a double-batch if you have to share. These delectable treats are crispy on the outside, tender on the inside, with a nice crunch from the walnuts. They pack a huge banana flavor, without being overly sweet. 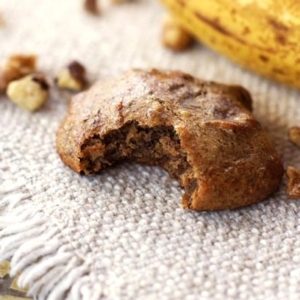 In fact, there is no additional sugar to worry about, making these a perfect "snack" cookie. Allow the mixture to sit for about 10 minutes-- letting the flax "gel" into the batter. Hope these cookies are a hit with you and your family as well! A Note on “Vegan-izing” Cookies: For those of you who have asked for more vegan, or properly combined, grain-free cookies, I’ve had GREAT success using a flax egg to replace the regular egg called for in my recipes. Make sure you follow this method for making flax eggs, for best results. Happy baking! Sure, I don’t see why not! I’m a newbie plant based eater in deep search of healthy snacks and these cookies are a winner! Followed your yummy recipe but freestyled by adding some molasses. Yum. Ate 4 and froze the rest in doubles to go with afternoon tea. Sending you a (((thanks)))fist bump. These are soooooo good. Made a double batch. I may have to hide them from everyone. Made these cookies today since I had practically black bananas that needed to be used up. Used pecans instead of walnuts, since that’s what I had on hand. They were great! I love how much flavor they have just from the banana! Thanks! Hi, I would like to make this cookies but, my little son can’t eat bananas, can I use pumpkin purée or any other fruit? I made this yesterday and it was SOOOO GOOD! I didn’t have enough to double the batch but I’m in love with it. Question, can I share this on my website with credits of course. I ask that folks don’t re-post my recipes on other sites, but you are welcome to share one of my photos on your website with a link back to the full recipe. I’m so glad you enjoyed them! Fabulous.. Just made these.. I subbed the almond butter and used natural peanut butter and used local unpasteurized honey instead of stevia.. Threw in a bit of hemp seeds for extra protein in goodness. Fabulous!!! Will be making these again! how many calories are in one cookie or entire batch? Megan, you are brilliant! These were so delicious! I used honey instead of the stevia and added some chocolate chips!!! 🙂 Amazing! These are delicious, I used honey to sweeten them. Definately is a cookie I didn’t mind the kids asking for more. When you use an egg instead of the flax seed, do you still need to let it sit for 10 minutes prior to putting on the cookie sheet? No, I don’t think that would be necessary with a real egg! Thanks! I made them and they turned out perfectly!! The entire family including my picky teenager loved them. Oh my yum!! Even the batter tastes good. Glad I made a double batch of these. Awesome and NOTHING to feel guilty about 🙂 Thanks so much for a great recipe. 🙁 I SOOOOO wanted to love these! But I didn’t. The crunchy walnuts were great but otherwise they had sort of a “glucky” texture. I made that word up, it’s when something kind of gunks up in your throat and you have to wash it down with liquid. I tried one warm and it was like that and I stuck the rest in the freezer, knowing the texture of GF baked goods is sometimes better cold. Tried one this morning and still have the same issue. I’m so sad. Maybe I didn’t bake them long enough…..but they seemed fully baked and if I break it in half it does look bread-like inside. Any ideas?? Hope you’ll find another recipe you like better! I am SO excited to make these! I recently made paleo bars with almond butter and zucchini and I was absolutely obsessed. Fab recipe! If you’re not vegan, you can use an egg instead of flax seeds. Otherwise, chia seeds can work as a substitute for flax. I REALLY appreciate your reply Meg! I am making them tonight!! Yeay! Actually, when I made them with an egg it made it too watery so I made them into muffins, but for cookies it seems that flax is better. Hi there- so, did the muffins turn out well? I really want to find a tasty banana bread/muffin recipe for my boyfriend’s birthday (he hasn’t had banana bread, his favorite desert, since he went Paleo about a year ago). At what temperature and for how long did you bake them? Thank you for any help! YUM! I’m snacking on them right now! I very nice snack, I can eat them all & not feel guilty! I was going to eat the last banana & that is when it hit me, to make these cookies so I can really enjoy this last banana!! I forgot to add a sweetener…but you don’t need to, they are great without! what can i use instead of flax seed? eggs? thank you! I don’t really care for the taste of stevia… is there another sweetener you would recommend that would work in this recipe? I love using honey, too– not sure what the measurement would be, so just taste as you go! Thank you for all your great recipes! I discover your blog through the Rose Cleanse and I Love it ! Thank you! I made this ones 3 times already !! My kids loved them 🙂 I change to chocolate almond butter instead of the regular and chocolate chips instead of the walnuts and these are to die for !!! Oh these are right up my alley…they look amazing! 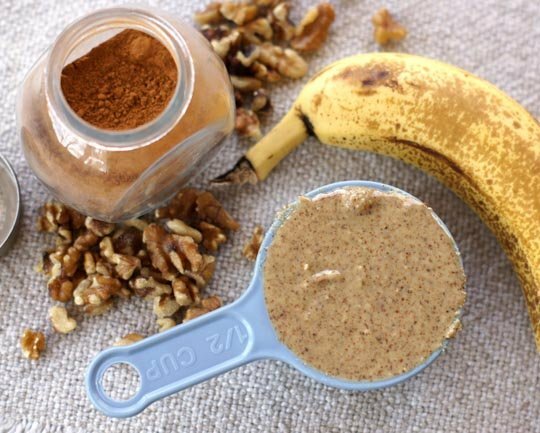 Wait a minute….so you are telling me that bananas and nuts/nut butter are properly combined? I love you! I have been having bad stomach pain and nausea lately after eating so I’m going to get back into combining…I’ve been slacking a bit! I am copying your chart onto my computer, it is so much easier than any other combining literature I have seen. Thank you! PS: I read somewhere that starchy bananas could also combine with grains/starch but I don’t see that on your chart. Is this wishful thinking on my part? Thanks again! 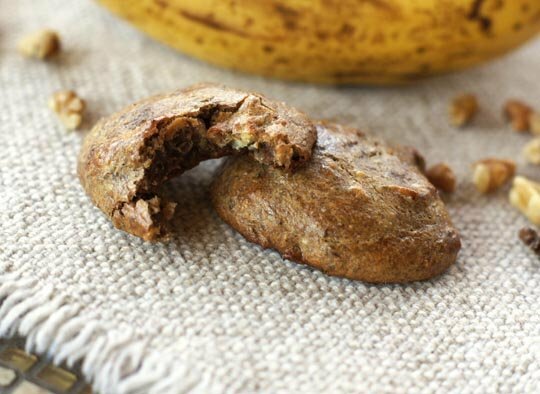 Yes, ripe bananas do combine with nuts and seeds! Yay! I love banana bread. I have made your cookies with coconut flour, would you combine coconut flour as nut based meal or as a starch? Cause coconut flour is little bit more starchy than almond flout or other nut flour. From what I can tell, coconut flour is made from ground, dried coconut– which comes from a mature coconut. Dried, mature coconut combines as a nut/seed, so that’s what I would personally do. It may seem “starchier” simply because it’s drier than nut-based flours. Oh wow, I love thisssss!!!! Just my flavors. I have a bread that uses similar ingredients…why haven’t I thought of making it into cookies? Look kinda like muffin tops! Love love love banana bread. Making these tomorrow with some fresh almond milk. 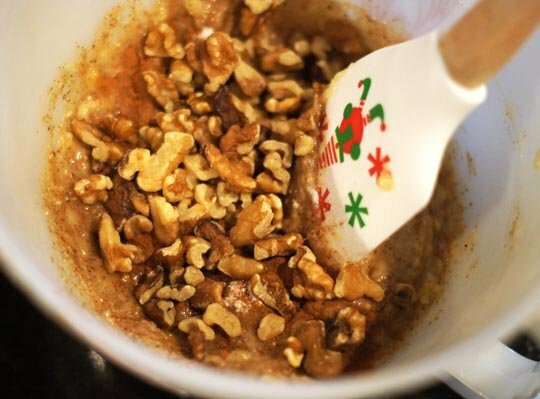 Love banana bread..these sound YUMMY, especially with walnuts! Have a great week! OH YUM!!!! Just finished off our walnuts, but a nice trip to the city for more seems like a small job for such yummy looking treats!! Thanks for this recipe! I want to make them for my clients this week 🙂 I have someone who is highly allergic to almonds though, so I would need to substitute the almond butter.. do you think peanut butter would throw the whole flavor off? Or is there another nut butter you would suggest? Thanks again girl! Peanut Butter Banana Bread sounds fantastic. 🙂 If you’re worried about the flavor, though, my grain-free Peanut Butter Chocolate Chip cookies would work great with a flax egg, too! Okay great! What do you think about using cashew butter instead? Also, did you actually use the “flax egg” in this recipe, or just the straight grounded flax? Loving all these delicious cookies! I’ve never tried cashew butter in one of these recipes, but I’m sure it will work. I didn’t use a “flax egg” in this recipe– just the ground flax, to help absorb some moisture from the banana. loving these grain free recipes! 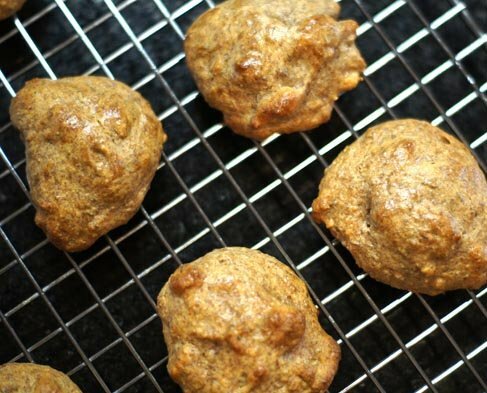 Looks delicious.Guilt free cookies=Happy Monday!!! Mmm if I had time this morning, I’d be making these for breakfast. PS. LOVE the new header! !